In the modern world we are surrounded by electricity and electrical cables, the technology for which has barely changed since its invention. Copper cables can be a significant weight in a new structure. (For example a Boeing 747 contains around 2 tonnes of copper cable). Some applications also need much higher conductivities than that of copper. There has therefore been significant interest in using alternative approaches, for example carbon nanotubes which are lighter, stronger and potentially near-super-conductive at room temperature. Dr. Koziol’s team of researchers in Materials Science are experts in controlling the structures and electrical properties of carbon-based nanotubes. They have developed a working open reactor which continuously produces 10 micron diameter wires of aligned carbon nanotubes with the scale up capabilities to kg quantities. These wires can then be used in a wide range of applications. In addition the reactor uses methane gas as its raw material (and can be adapted to use CO2), thus reducing greenhouse gases into a useful solid material. 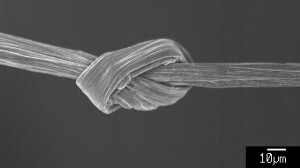 The researchers have developed a number of working electrical prototypes using their unique carbon nanotube material, including electrical transformers, motors and generators. One immediate issue that they have had to overcome is that of how to connect their carbon-based devices into traditional copper-based equipment. Traditional soldering materials which work for copper do not attach to carbon. Dr Koziol’s team has developed a new patented soldering method specifically for joining carbon-based materials to copper and other metals, and are already generating positive feedback from their industrial contacts. The soldering methods, which are simple to use, provide good electrical conductivity from copper to carbon, and also provide a physically-strong connection between the two materials. They can also be used to connect carbon materials to other carbon materials. As a result there is a potential to spin-out a new company which will sell the new soldering materials and methods. The challenge for the i-Team is to investigate the different applications which need the ability to join carbon materials to metals, including electrical and non-electrical uses, to help the researchers select and focus on the most appropriate target markets for the soldering technology.